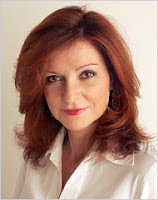 the nytpicker: Maureen Dowd Plagiarizes Self! Calls Sarah Palin "All Cage, No Bird." She Called Barack Obama That Last September. "throws around titles and phrases the way the rest of us breathe"
except yours is tired and ubiquitous, while hers is original. I believe most writers can use their own material as much as they like - thats not plagiarizing. as for its meaning, i think its pretty clear as a cage w/ no bird is something without value, substance but still retains the appearance of such.